Perth and Kinross Council has appealed to residents to help protect the area's play parks after a spate of vandalism. 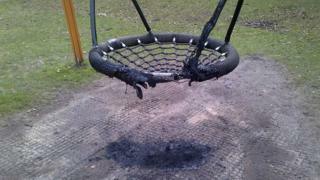 Damage costing £3,660 was caused when play equipment was set on fire at a park in the North Inch area of Perth. A child was injured after bolts were removed from of a piece of equipment in another park, and "significant damage" was caused to items in the play area at Perth Leisure Pool. The council asked locals to be vigilant and report suspicious behaviour. The authority has had to replace or repair equipment in several of its 150 play areas, and said the cost of replacing damaged climbing units and sand tables at the leisure pool park would be "considerable". Douglas Pover, convener of the council's community safety committee, said he was "saddened" by "the inconsiderate actions of a minority". He added: "I would like to take this opportunity to highlight that the safety of equipment in the council's play areas is checked and playgrounds are cleaned on a regular basis to ensure play areas are safe, well maintained and pleasant to use. I hope this brings some reassurance to parents. "I would urge residents who notice any damage or vandalism to equipment to either report it to Police Scotland or alternatively report it to the council."